Electron currents in plasma are usually modeled using classical diffusion. However, semiconductor studies have shown that there is a problem with using classical diffusion for modeling electron conductance: it leads to nearly uniform probability distribution of electrons, what means that electric field would make them flow - making semiconductor a conductor. In contrast, semiconductor is usually not a conductor due to Anderson localization: e.g. QM ground state has highly localized density, preventing conductance. It shows that standard diffusion often only approximates the principle of maximum entropy required by statistical physics modeling. 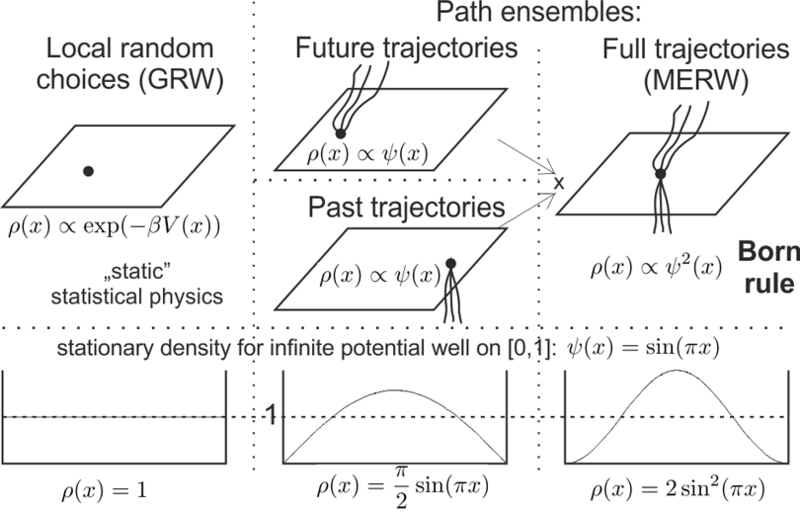 MERW repairs this approximation, by the way repairing the discrepancy with QM prediction (and reality) - its stationary probability distribution is exactly as for quantum ground state: with Anderson-like localization property. The agreement can be also seen through popular euclidean path integral formulation - there are some small differences but both assume uniform or Boltzmann distribution among possible paths. Sure in practice we have no infinite potential barriers, but energy of electrons is comparable to local potential differences - of barrier slope. For complex inhomogeneous filed such thermodynamical effect can be huge - while small local differences of potential lead to small differences between local behavior of standard stochastic propagator and maximizing entropy QM-like ... globally they lead to completely different stationary probability distribution: while standard diffusion has nearly uniform distribution, MERW/QM ground state can have localization with density lower by many orders of magnitude. Intuitively, while in standard diffusion electron flow is nearly uniform, in MERW it kinds of short-circuits through lowest resistance regions, like in formation of lightning. Is there maybe experimental evidence suggesting that standard diffusion models for electrons currents in plasma predict insufficient localization?